The Jewish community has probably had more run-ins with the Guardian than every other British newspaper combined. This matters on two levels: emotionally, because the Guardian exemplifies the kind of liberalism that many Jews instinctively feel; and, politically, because of the moral tone that the Guardian sets within British life. In recent years, Jewish upset has been exacerbated by the Guardian’s Comment is Free (CiF) website, which carries many more articles than the print edition; and is fundamental to the paper’s future. CiF’s initial growth was tarnished by failures to adequately moderate readers’ comments underneath the actual articles. After much effort, this was largely remedied. Nevertheless, from a Jewish perspective at least, problems persist with the actual CiF articles themselves. It was refreshing to see CiF recently feature a particularly spiky anti-antisemitism piece by Tanya Gold, but last week it reverted to type with a particularly poor and offensive article by Rachel Shabi. Its title claimed to reveal how “Israel’s rightwing defenders” make “false accusations of antisemitism”. Shabi is welcome to her opinion, but after all the grief between the Jewish community and the Guardian, you might hope that they would hesitate before publishing such a shabby piece of work. Its extremely ugly headline and sub-headline (see below) are plain insensible; it has utterly inadequate levels of proof; it has utterly partial summaries of the sources that it links to; and it refuses to acknowledge that opposition to the phrase “Israel firsters” might be something other than an evil deception to defend Israel. False accusations of antisemitism desensitise us to the real thing. Attacks on the New York Times’s new Jerusalem correspondent undermine the credibility of Israel’s rightwing defenders. So, surely the article is about how the NY Time’s new Jerusalem correspondent has been falsely accused of “antisemitism” by “Israel’s rightwing defenders”? Well, no actually. The article’s first three paragraphs deal with the new correspondent, Jodi Rudoren. Shabi claims Rudoren has been called an “anti-Zionist”, but there is no mention here by Shabi of antisemitism, none whatsoever. The word doesn’t feature, nor in any of the three articles linked to by Shabi’s article (here and here and here). It isn’t even hinted at in any of them. The headline and sub-headline are simply wrong and insensible. This, despite their being so provocative and insulting. Less importantly, the word “anti-Zionist” appears in quotation marks, as if this is what Rudoren has been called. No source is given for this claim. Click on the links provided by Shabi’s article, and you still won’t find it: you’ll find criticism of Rudoren, strong criticism of whom she has tweeted with, people saying she gives the impression of being partial, but you won’t find the simple “anti-Zionist” accusation – and, I repeat, far less anything mentioning antisemitism. And that is the “false accusations of antisemitism” as stated in the title. All of this, brought to you by Guardian Comment is Free: which is why it matters. 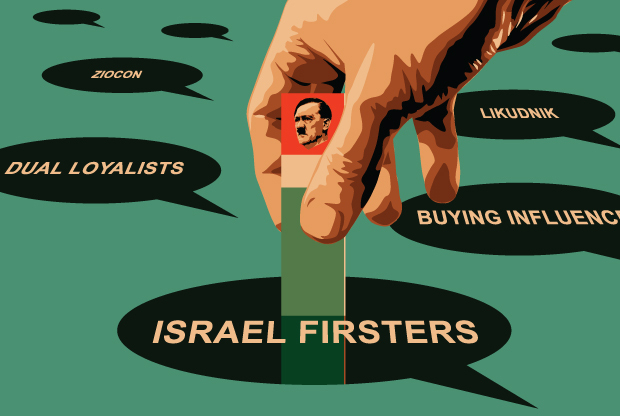 Those who accuse pro-Israel advocates and American Jews of having “dual loyalties” and being “Israel Firsters” are engaged in anti-Semetic hate speech. Period. These are age-old canards and anti-Semetic smears that go back centuries, suggesting that Jews are disloyal, alien and cannot be trusted. This kind of rhetoric has no place in civil dialogue and anyone’s politics, but especially among progressives. The organizations who pay the salaries of those using such hate speech, (see below for specific examples), and who have clearly had it brought to their attention, must either confront it and end it, or take full responsibility for it. In this case, that choice belongs to both CAP and Media Matters. This is a free country and people can say what they want, but the question for those organizations is whether they are an appropriate home for such discourse. Let’s hope that soon we will be able to say the same of CifWatch. dubi, You have added to the tarnishing of FAKE “anti-war” activists and invokers of “international law” immeasurably. Dubitante, why do you keep ‘hoping’ zionists operate on a level of morality that your visceral bigoted instincts tell you they are incapable of reaching? Are we still playing the ‘I’m the victim of zionist double standards’ game? Being first off the block with the comment above, you seem very eager to wear your heroic, selfless endeavours on your sleeve like all good, progressive, self-serving Jew-baiters. Indeed. We all hope you´ll be banned for spreading your contumacious racist judeophobic lies. In the past Jew-haters claimed the right to decide who are a Jew and to give moralizing lectures on everything Jewish. Nowadays, “progressive” Jew-haters continue to hector Jews and think they can decide who is anti-Semitic. another grotesque crust theyr moral and intellectual perversion. Yeah, it´s about YOU, prof doo-doo. Shabi talks about the “compulsive nature” of Israel advocates’ use of the “antisemitism” charge without ever confronting the compulsive use of language with clear antisemitic pedigree by Israel’s critics. You’d never see so-called progressives say blacks or hispanics in the us overplay the race card or muslims all over the Western world are compulsive in charging secularists with islamophobia. Israel has real policy problems that need to be confronted in a way that understands the context within which these problems arise. One doesnt have to peddle in blood libels, dual loyalty charges or demonizing charicatures to make that point, yet for some reason people on the Left are increasingly comfotable doing so. Quite right. But such context is almost entirely absent from the narratives of states and their stenographers in the corporate press. Only rarely will you see the Israel-Palestine conflict contextualised correctly, with its roots in British imperialism, the last unresolved European colonial project. Islamist imperialism, Socialist imperialism have taken the main stage from British Imperialism. The boundaries of Iraq and Jordan were drawn by the British without taking into account the details of the various tribes inhabiting the area. The fact that Arabs are killing Arabs, that the Islamic Republic of Pakistan almost had a nuclear war with India, a dispute over land, all prove that Israel isn’t the problem. Islamism is. And the boundary of CisJordan/TransJordan was drawn by Britain without the approval of the League of Nations. The land theft in the Middle East was right there. And the land was taken from Jews to give to Arabs who did not have to put up with Jews in it. Ethnic cleansing. And oh, the designs those same Arabs have on Saudi Arabia, If the ‘Palestinians’ overthrow the Bedouin it’s pretty obvious where those currently trying to acquire Israel should go. Not really. How many Islamist states have conquered other states and Islamized them since the end of the British Mandate? Exactly. The same can be said of British supports for the creation of a Jewish national home in Palestine, the rights of the indigenous people were not taken into account. We only escaped WWIII, and the possible end of the human race because a Russian sub-commander countermanded an order to launch their nukes against the US. The US and Russia brought the human race to the brink of disaster, possibly extinction, all without the help of Islam. But don’t let these details bother you. You seem to think conquest can only be an affair of armies and guns. You think wrong. Look at Western Europe and tell me. Though I’m sure I’ll be getting a few R-words, maybe there’s a slim chance you might educate yourself. The Jewish nation is the indigenous people of Palestine, anti-Zionist scum. Don’t let a non sequitur get in your way of wishing to appease the Islamic world on the Jewish State’s expense. Doo-doo should soothe her guilt by surrendering her island to the “palestinians”. And, talking about indigenous peoples, you should pay reparations to the Romans. And go demand the Spaniards to return Andaluzia to their rightful owners. Yeah, doo-doo, go on with your farce. This is why I think anti-Zionism is illegitimate. This, the wholesale denial of the Jewish connection to the Land of Israel in favor of framing Zionism as a 19th-century European colonialist project, is why I think anti-Zionists don’t deserve a shred of respect. The Jewish–Muslim conflict is rooted in the Islamic injunction that Jews (and Christians) must live as second-class apartheid subjects under Islamic mastery, hence the affront of the renewal of Jewish political sovereignty over the Land of Israel. Despite its later reworking into an Arab anti-colonial struggle following the First World War, and even later the entire fraud of cooking up a non-Jewish “Palestinian nation” from scratch, at its heart this is not, and never has been, about land dispossession of or national rights for the Arabs, who have more than their fill of that (over a score of states, most of them well beyond the Arabian Peninsula, the indigenous territory of the Arab nation and the only piece of land the Arab nation truly has a right to), but Islamic imperialist greed. Israel is innocent and her enemies are guilty, for Israel is a national renewal project of a single nation upon its one and only piece of land in the world, while her enemies want to rob the Jews of what little they possess despite themselves possessing so much. The contrast could not be clearer. And that is why the propagandists among Israel’s enemies have found it necessary to concoct a totally fictitious narrative to muddy the waters first and turn the truth on its head next. But the lies will not forever stand. If we accept this as an argument, and it would constitute lunacy to do so, we would also have to accept that other states and sub-national groups can turn back the clock to an arbitrary point to claim land. Perhaps the Italians can lay claim to England on this basis? Like I said, lunacy. It’s an argument that is peculiar to Zionism. Placing the rights of European immigrants above the rights of the indigenous Arabs, many of whom were of families which had lived in Palestine since antiquity,is pure colonialism. Without British imperialism, there would have been no Balfour Declaration, no League of Nations Mandate, no partition plan, and almost certainly, no Israel. To suggest that the conflict isn’t rooted in British Imperialism is to deny the obvious. In one ear and out the other. As always with you. That crucial bit about the entitlement of [real] nations to their indigenous territory, and only to their indigenous territory, rolled you like water off a duck’s back. Anti-Zionism is analogous is to claiming, not that the Italians can’t have England, but that they can’t have Italy. That’s where its big affront lies. Jewishness is not defined by race, you anti-white racist apologist for Arab imperialism! A Jew of European extraction is as much a Jew as one from the Arab world. Colonialism requires a motherland. The Arabs in Palestine are colonists out of their motherland, Arabia. For the Jewish people, the motherland has always been none other than the Land of Israel a.k.a. Palestine. The anti-Zionist denial of this is why anti-Zionism is at the very least an accessory to Jew-hatred. And no Saudi oil industry bankrolling Islamic imperialism right now. But you don’t blame Islamic imperialist aggression on the misdeeds of the British Empire—only the conflict over Palestine. That speaks volumes. Unlike the fictitious Jewish nationalism, which didn’t exist until the end of the 19th century? Suggesting European adherents of Judaism were indigenous to Palestine is like suggesting that as an Englishman of Anglo Saxon descent I’m indigenous to Germany. The height of dishonest intellectual gymnastics. No, it’s the same as saying that Anglo Saxons don’t have claim to Germany. Pathetic. White Europeans have masses of land, so why can’t I expel Germans to reclaim my national home? It requires colonisation by invaders. Do you accept that Israel would not exist were it not for British Imperialism? I blame a lot of things on British imperialism, but right here, right now, the legacy we’re talking about is the Israel-Palestine conflict. I’ll ask again: Do you accept that Israel would not exist were it not for British Imperialism? I wonder why so much effort is expended on keeping tabs on Holocaust Deniers when there are those like you who engage in far worse historical denialism. Jewish nationalism is 3000 years old. Between the Israelites of Moses’ time and the Jews of today an unbreakable link exists. Denials notwithstanding. …are Jews like all other Jews. Your anti-white racism is showing. It’s the Jews’ Arab cousins who have the same relation as Anglo-Saxons to High Germans. Because “white European” isn’t a nation. “Arab” is. The Arabs in Palestine are colonists by virtue of being invaders, then. Only as a means, an indirect vessel, an instrument. If not British imperialism, then some other historical means would have brought to the renewal of Jewish sovereignty on Palestine. The Jewish State owes the British nation nothing, nor does it have any part in the colonial misdeeds of the long-gone British Empire. Yes, that’s your obsession, I realize that. Hard as it may be for you to accept, however, this “legacy” or whatever you call it is not going to be undone. The Jewish nation is not going back to life under precarious foreign rule, nor is its state spacious enough to be shared with any other nation. Deal with it. White Europeans have masses of land, so why can’t I expel Germans to reclaim my national home? … It requires colonisation by invaders. Dubitante. And without European imperialism – the Roman Empire, the Jews would not have been expelled from their homeland in the first place. And this imperialistic impulse was all encompasing – spiritual as well as physical, as the Holy Roman Empire claimed to be the representative of God on earth, and spread the lie that the Jews are the antithesis of Christ himself. You do the same with your imperial delusions of grandeaur: What constitues a Jew, what constites anti-Semitism, who has sovereign rights and who doesn’t, who is enlightened and who is beyond redemption, ad nauseum. “If we accept this as an argument, and it would constitute lunacy to do so…” No it wouldn’t, and no it doesn’t. “Perhaps the Italians can lay claim to England on this basis.” No they can’t, because it doesn’t apply. Italian culture did not originate in England. The Romans invaded England, as the Arabs invaded, conquered and colonized Palestine. Arab culture is not indigenous to Palestine. It’s an import. And as far as the Palestinian Arabs being there from antiquity, no one can seem to find a trace of any such national culture. The Arab Palestinians will have to compromise and make room for the earlier indigenous people and stop pretending there’s no Jewish history there that preceded them. They know it’s a lie…and so do you. “Without British Imperialism, there would have been no Balfour Declaration, no League of Nations Mandate, no partition plan, and almost certainly, no Israel.” But there were all of these things. To suggest that we can’t turn the clock back to an arbitrary time and then to propose turning them back to an arbitrary time of your own choosing truly makes you as luny as a tune. It’s also not the only land to be partitioned, you know, so go find something else to do, and stop trying to scapegoat Jews for British colonialism, because I detect that that’s not what this is really all about. Or do you wish to dismantle all countries that have a British colonial past? The list is long, but your obsession is quite narrow. This is the justification that some of these “internationalists” and fake-humanists use to justify their delegitimization attacks against Israel. But as you noticed, this is just an excuse, as if they were really sincere they´d be working to dismantle THEIR countries first. But they only whine about Israel. So, their motivation is pure judeophobic hatred. That´s the most plausible explanation. It´s seems, though, that in his later years he sort of reconciled a bit with his Jewishness. A bit late, though. I really don’t think you know anything about Marx, or Marxism. Oh, dear, are you upset that your hero was an anti-Semite? You can join prof doo-doo and stick your head in the sand. Man, what a bunch of crap. That´s why you´re the doo-doo here. So, your fixation now is on the “corporate media”. So, quit this sweeping generalization and NAME those corporations and the journalists. Or else just shut up. This is the tactics of a run-of-the-mill ideologue. A certified palestinista. Listen, doo-doo, go resolved YOUR (if you´re really British) unresolved colonial mess that you left all over the world, particularly the sh*t you made in Africa, but also the India-Pakistan conflict. And don´t forget Gibraltar and Las Malvinas. As for Israel, she´s no colonial project, but the Jewish State and she´s pretty much successfully resolved. And that´s what makes your hemorrhoids burst. Yep. Furthermore, it’s because Israel is no colonial project that it isn’t the disaster Lebanon or the Congo became. The British imperialists drew neat, straight lines all over Asia and Africa without regard to ethnic groupings, and now those continents are plagued with decolonial pseudo-nations chafing under the burden of forming national cohesion on a totally arbitrary basis. In the ME, only Israel, Turkey and Iran (maybe also Egypt to some degree) have been spared the strife of multinationalism à la post-breakup Yugoslavia, because they’re the only true nation-states, states that were created each for their ethnic constituency and not the other way round as in decolonial proposition nations like Syria and Lebanon. Zionism failed as a nationalist ideology. Up to 1939, Zionists failed to convince Jews that their national home was in Palestine. It took the full horror of the final solution, along with Zionist campaigns to ensure Jewish refugees were denied refuge elsewhere to make Zionism achieve critical mass. If it failed to convince Jews, is it surprising that it fails to convince many others? How could a doodoo have any knowledge or sense of history. Well, she gets it from those “respectable” and “authoritative” sources, such as Norm Finkel-Stinkel and Noam Chumpsky. Ah, and Edward Said-so. Paul Bogdanor has a handy list of such (Jewish) ones. As for Said, as soon as “oriental” or “orientalism” appears we know whose can the user dripped out of. A “stone”-thrower’s. It is never easy to convince people to leave the comfort of a home, especially one they feel is safe (Germany then felt for its Jews like the U.S. now), and especially as Palestine at the time was still not yet completely out of the unappealing state documented by late 19th-century travelers. To fault Zionism for this is to expect Zionism to have supernatural convincing powers. An unreasonable expectation. You seem to think the Jews’ right to political sovereignty on and unrestricted inhabitation of their one and only piece of land in the world is contingent upon convincing the world and gaining its permission. I’m sorry to break it to you, but it isn’t. The Jews no more need your permission than the Greeks need to convince non-Greeks of their right to Hellas. Zionism is not on trial, but you are. The Jewish State is not the guilty part, but her enemies are. Let there be no misunderstanding here. This is why, at the Evian conference, the Zionist delegation demanded that 200,000 Jews be admitted to Palestine as the only solution. Your faulty thinking is showing. You believe that prior to the advent of Zionism, Palestine belonged to Europeans with little or no connection to the land, rather than to indigenous Arabs many of whom are from families which lived Palestine in antiquity. You would do well to revisit that assumption. You’re suggesting that an indigenous people require the permission of European colonisers in order to have their right to self determination. Pretty pathetic, really. They wished to leave an Old Country that was unsafe (Tsarist and Communist Russia) for countries that were safe. They did not believe Palestine was safer than the Old Country. They were wrong, but hindsight is 20/20. There’s a difference between “feeling threatened” and actively lobbying to block all other places of refuge. Your claim that the Zionists effectively enabled the Holocaust borders on a blood libel. Zionism was renewed in the 19th century, not cooked from scratch. Nationalism and the longing to return to the Land of Israel has always been part of the Jewish psyche, throughout all the Diaspora. Ashkenazi Jews have never been just Europeans, but Jews who happen to live in Europe; and from being Jews follows their natural connection to Palestine. No, I’m suggesting that the one and only indigenous people of Palestine, the Jewish people, needs no permission from anyone else—not Arab colonists, even if they fraudulently take the name of “Palestinian” for themselves to lead people astray, nor European sympathizers of Arab imperialism like you—for exercising their rights to their one and only indigenous territory in the world. Zionism is just, anti-Zionism is a cause of injustice. Zionism is rightfully-held nationalism, anti-Zionism is imperialist aggression. You would do well to revisit your pro-imperialist stance. Would you like some cream with your wishful thinking? Zionism was deeply unpopular amongst European Jews, largely because it was seen to be aligned with anti-Semitism (and for good reason). This is precisely why the Zionists failed to convince European Jewry that Palestine was their national home. Zionists were extremely clear on this point. Ben Gurion was very clear in preferring 500 Jewish children to survive and flee to Palestine, than see 1000 Jewish children survive and flee to Britain. Ha! So much so that the vast majority who left Europe prior to 1939 couldn’t wait to go somewhere else. Quite the cohesive nation :). And while the cohesive European Jewish nation were travelling to the US and Latin America, where were the Arabs of Palestine? That’s right, they were in Palestine, where they had been century after century. The one and only?? Brilliant! The one and only indigenous people who were doing their best not to go to Palestine?? Seldom do I see someone’s argument unravel so spectacularly 🙂 Kudos! Let me guess: “Exaggeration” must be your middle name, right? Nope. Some Jews (especially the Reform) opposed Zionism for disturbing their attempts to assimilate, but for others it was their lack of desire to move to a largely desert land, and for still others, the association of Zionism with secularism. Nice. Another of the “Jews have earned their hatred” line. And you wonder why anti-Zionism and Jew-hatred are so often conflated—for good reason. The failure to convince pre-Holocaust European Jewry is for the same reason there is not yet a flood of American Jews to Israel right now: People are naturally reluctant to drop everything and abandon all their comforts and familiar surrounding in favor of the new and unknown. Because a lot of them believed a state would come first, and only then mass aliyah. Again, to say they were wrong is to commit the error of hindsight sagacity. Most of them, in neighboring Egypt and Syria, there to stay as they had for centuries, until suddenly they saw the Jews had made a near-desert bloom. To quote your own expression: Fiction. Indeed. And this failure cost the lives of 6 million Jews that stayed in anti_Semitic Europe, YOUR Europe, that enthusiastically perpetrated the extermination of their Jewish citizens across the continent. That same incurable Europe which is back again to her usual decandent obsessions and perversions, as exemplifed by the amount of doo-doo it produces. Haha, what a loser you are, doo-doo. You hate Jews so much that your hemorrhoids are bursting. No, doo-doo, *YOU* failed as a human being. Mull over it. Eh? Are you just deliberately trying to be offensive? “If we accept this as an argument, and it would constitute lunacy to do so, we would also have to accept that other states and sub-national groups can turn back the clock to an arbitrary point to claim land. Perhaps the Italians can lay claim to England on this basis? It can be comforting in a way when comments are made that reveal consummate historical ignorance or wilful denial of inconvenient truths, and here is one. It’s like wondering why an apparently sound protagonist cannot see reason and then discovering him to be a troofer, unable ever to do so. To suggest that a title of ‘lunatic’ attends the idea that Judaism is centered on the holy Places of Palestine and that Jews are indigenous to the area is so mean in its interpretation of a people’s heritage as to attract a label of more pejorative weight, one suitable for vile opinion that demeans us. Italians do not weep for England and do not die in their efforts to make her shores. And prior to 1939, Jews did not weep for Palestine, nor did large numbers make attempts to land on her shores, given that the vast majority who left Europe chose to go to the US or Latin America instead. This eternal longing for Eretz Yisrael has, I’m afraid to say, been airbrushed into history after the fact. They did. Look at a Jewish prayer book. Does “By the rivers of Babylon” ring a bell? You do project your own penchant for historical airbrushing, Doobs. Fiction. You simply cannot reconcile Jewish opposition to Zionism and reluctance of Jews to emigrate to Palestine with the fiction of cohesive Jewish nationalism prior to 1939. Orthodox Jewish religious opposition to what was up until recently a largely secular and secularizing movement. No different from their opposition to Reform Judaism. Not opposition to the idea that the Jewish nation has an eternal right to the Land of Israel. Except for a few extremists who’ve let themselves run away with their anti-Zionist theories—the Neturei Karta—the Ultra-Orthodox Jews are not the kind of anti-Zionists you want them to be. As anti-secularists, they’re already becoming reconciled to a Jewish State whose populace is coming back to religious observance in droves. The only reason I reply to historical denialist Sandbaggers like you is to show readers how easy it is to refute you. In and of yourself, you deserve no reply. Just go away, doo-doo, you maniac anti-semite. Yeah, you´re an expert on that. That´s essentially what you are about: writing fiction and judeophobic propaganda. She reacted to “Jewish prayer book” as a vampire reacts to a crucifix! Why this troll embarrasses itself by appearing here, spouting absurdities about a culture that it doesn’t understand at all, is not a mystery but it is a bore. “This eternal longing for Eretz Yisrael has, I’m afraid to say, been airbrushed into history after the fact. Why would anyone take your perspective on what Jews think or say seriously? Dubi, you are a hatemongering twit with no life and very little of a future. May you continue being a victim. It really suits you well. Readers / Advertisers: Boycott the Guardian! OK. First of all, why would you want to “insult” people who disagree with you about a geopolitical matter? “Make a counter-argument”, “explain our position”, “try to convince you of the error of your views” – all these would make sense. But “insult”? I personally am not constantly looking for “acceptable” ways to “insult” people who disagree with me politically. Am I the only one who finds this wording strange? Secondly, to address the broader point, you can “insult” members of the “Israel lobby” for their political views in EXACTLY THE SAME WAY as you would “insult” others whose political views you disagree with. Cogently, relevantly, and with some modicum of objectivity. Without bringing disgusting medieval racial stereotypes into it. You know? Like normal political argument? It’s really not that hard. Some of us do it all the time. “Am I the only one who finds this wording strange?” No you’re not. It was the first thing that struck me as well, and it tells everyone whose brain hasn’t been completely pickled, that’s something is just not right about these people. “I personally am not constantly looking for ‘acceptable’ ways to ‘insult’ others whose political views you disagree with.” This is the way these people deal with the world. Consider this: It was thought about by the author, written down, edited by the author, then went to an editor who discussed it with the author, and yet still made it into print. Not very bright, is it? Consider this one: “False accusations of anti-semistism desensitise [sic] us to the real thing.” -from someone who’s desensitized to the ‘real thing’. Consider what the same people consider fair game: Jewish Zionists dictate U.S. (and I suppose U.K.) foreign policy (Jewish “power”) have dual loyalties or are “Israel Firsters” (disloyal to their “host” countries), Cast Lead was an attempted ‘genocide’ of the people of Gaza involving serious ‘war crimes’ (bloodlust), Israel employs checkpoints merely as a means to ‘humiliate’ Palestinians (racial supremacism), that the Israeli Jews are committing a “genocide” against the “Palestinian People” (Nazis), have constructed an “Apartheid” “wall” to keep the “races” separate (even though 20% of the people on the ‘Jewish’ side of the ‘wall’ are Arabs who share all public accommodations, and that a few hundred thousand Jews live on the “wrong” side of the “wall”), the state is based not on nationalism, but “racism”, and that the Israelis are just ‘itching’ to go to war with Iran and don’t want peace, because if they did they would commit political suicide. Jeff, that’s beautifully put. In Britain, Jews don’t escape a thing, being blamed even for massive Muslim immigration. That’s by the far right since the far left wants all of us subservient to Islam and somehow the two amalgamate with no good result for anyone. Something else that the bashers may not have thought of: they could have it the wrong way round. Rather than “false accusations of antisemitism” masking instances of “real antisemitism”, could it not be that their constant exaggerated, bad-faith and invalid demonization of Israel is desensitizing otherwise good and reasonable people to the potential validity of measured and rational criticisms of the Israeli state?